CFO's, Controllers and CXO's want to know the "So What" of the business and the same is true for Revenue Recognition. Providing analytics for revenue forecasting, creating accurate P&L's for 10K's and 10Q's and other reporting are essential. This webinar provided several examples of reports available using SAP RAR, including both standard reports and extended reporting examples that we have created based on our experience with clients. The presentation was followed by a live Q&A. 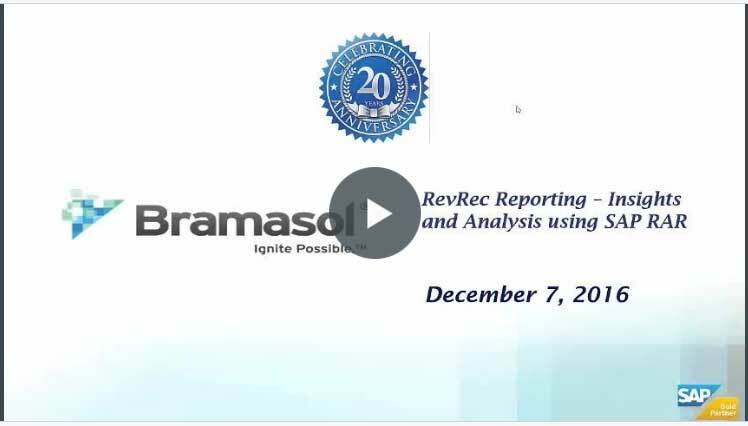 Click here to view this webinar and others within the Bramasol RevRec Webinar series.